Climbed on May 27. 2017. A good starting reference is the village of Innvik, this is along Hwy. 15 connecting Byrkjelo and Stryn. From Innvik, drive uphill (south) and follow the road that climbs into the (only) valley above Innvik. There is a self-serve toll road as you get higher up (NOK 50 in 2017). After you have gained 500 meter of elevation, fork right where a road descends to the river and crosses to the south side. Find parking along this road that serves a few mountain cabins before it ends. The road ends at a private cabin at location N61.82262, E006.66934, elevation near 590 meter. Ski directly uphill through reasonable vegetation that quickly gets sparser. There is a large bowl higher up, the route should at the east (left) side of this bowl and continue more south-east climbing the broad ridge that connects to the much more distinct north ridge of Storlogpiken (1553m). Near the upper end of this ridge, there is a short, but significantly steeper section of the ridge. In summer, this section may be scrambled (easy climbing), in the spring, one may normally be able to kick steps up this section. One should bring an ice axe and crampons if unsure about the conditions. From the cairn of Storlogpiken, a local summit is about 1.5 kilometer to the south-east. The terrain is very gentle, first a slight downhill, then a much longer, but extremely gentle uphill. This route pass slightly on the east side. Next, descend another gentle slope to the next col, then contour around the next hill on its right (west) side. Continuing in the same general direction, the route ascends slightly before desending into the dip before a final, somewhat longer ascent to the peak that is located next to Ceciliekruna. This peak is almost as high, exceeding 1700 meter. Be aware of the cornice that prevents a direct descent to the final col separating you from Ceciliekruna. Normally, this may be easily bypassed by first desending more south, then cut left and ski back into the col. The landscape is quite spectacular in this area. From the final col, ascend up between the two summits of Ceciliekruna. These summits are almost equal, with good views from both, they are easily visited. The left (north) summit is supposed to be one meter higher, it is the one with a proper cairn. There may be cornices and care should be exercized when walking close to the cliffs. New plans were needed. The best option seemed to be a visit to a cabin above the village of Innvik. If the weather stayed nice, we could then make a skitrip on the terrain near Myklebustbreen, an area that few of us had visited before. This turned out to be an excellent plan. This cabin was owned by the father of Inge, one of the participants. It was well equipped with a BBQ grill and and outdoor hot-tub, water from the creek, with wood burning heating. We raided the local store in Olden and subsequently had a great evening with food, drying equipment and the hot-tub. The next morning, we could start hiking directly from the cabin and soon we were on snow skiing up the north-facing slopes towards Storlogpiken. The upper part of this ascent was quite steepish, but the snow was near perfect for kicking steps. We arrived at the nice cairn before 1100. What remained was a nice ski trip along the high terrain with several smaller ups and downs to the peak located just inside of Cecilekruna. The separating col is almost 100 meter deep, an easy way to descend was located towards the south side. We arrived at the northern summit at 1300, good views and a very nice day. We subsequently crossed south and ascendded the south summit, it provides a good view into the Olden valley. Leaving the second summit shortly after 1330, we had a nice ski back to Storlogpiken, visiting the independent mountain located South-East of Storlogpiken along the way. Descending, one of the participants, Victoria, impressed everyone by actually skiing down the steep section, the rest of us felt that the only "safe way" was to carefully climb back down in the steps we had kicked while ascending. We were all back down at the cabin by 1600. A few now returned to Bergen, while Selina, Victoria, Åke and I slept (outdoors) near Stryn. The next morning, we ascended the 1000 meter vertical route to the mountain called Hovden. About half of the route is a via ferrata, including a couple of airy bridges. Hovden had just 2 weeks earlier opened a spectacular gondola skylift, the second steepest in the world. 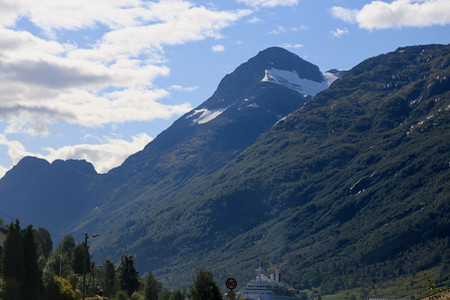 A single span carries people from the fjord to 1000 meter of elevation in 5-6 minutes. A quick ride down, before we parted with Victoria and headed back south to Bergen.